Samantha is terrified of getting older, of her children leaving home, of being alone. These feelings scare her so much that she invents ways not to face her fears. Mostly, she lashes out at others for “making” her feels bad. She wonders why she has so few friends and can’t find a mate. Fred doesn’t walk, he swaggers. He doesn’t talk, he commands. When his children and friends head for the exit, he figures they just don’t have the guts to handle such a big man. But, he has an ulcer and he can’t sleep. Lately, he’s been having nightmares about being trapped. Deep, deep down, he’s afraid he’s really a little man after all. It is painful to admit that we are vulnerable. For so many of us, it means we are weak, helpless and open to attack by others or by whatever life throws at us. Our culture demands that we be strong, so we try our best to hide our fears and cover up our weak spots. We don’t want to be seen as failures. Often, we believe that keeping a stiff upper lip will keep us strong. We hold a tight lid on our fears and pain; but in doing so, we also cover up and lose touch with our feelings. This, in turn, shields our hearts and separates us from our connection to humanity and a deeper more intimate connection with ourselves. This is a journey that can be long and difficult, but it’s only by facing our vulnerable places — not covering them up or running from them — that we can get to the other side of ourselves and recognize deeper roots to our alienating and defensive behaviors. If Fred and Samantha, the individuals previously mentioned, could get beyond their defensive behaviors and recognize their own vulnerability that is their sadness or their fear, than they could become more open with others, gain support from others and start a healthy process of healing and working through their problematic patterns. This change could lead to a deeper feeling of satisfaction. Being vulnerable is empowerment. It can be empowering to express to your spouse that you are hurting in reaction to some aspect of your spouse’s behavior. It is courageous to open yourself up to your vulnerability, your feelings, and then also courageous to take the risk and to express this to your spouse. This act of vulnerability enables you to identify and own your feelings and also breaks down your façade that keeps you walled off from your genuine feelings. It also can potentially enable you to have a closer and more intimate relationship with your spouse. One façade that men have traditionally held concerns the block against feeling sadness and hurt. In being identified with this so-called ideal, that one should not feel or express sadness or hurt, we develop a narrow, restricted and false view of our emotional self. By breaking through this restricted view of self we develop more emotional flexibility and find out that we can actually become stronger. It is an interesting paradox that through the genuine acceptance and exploration of our own weaknesses, we can become stronger and more empowered. It is important to note that we all have a wound, a weakness, and that when we allow ourselves to be vulnerable, we accept that wound and then we can move forward. Our wound can actually turn out to be our blessing. Being vulnerable has not been very popular in our society, but that is changing. Words such as “humility” and “gratitude” and “forgiveness” are being used more frequently. They are terms that show a cultural shift towards accepting all human traits, negative and positive, strong and weak. Author and therapist, Beth Miller, takes this one step further. In her book, Resilience: 12 Qualities to Cultivate, she calls vulnerability “falling apart” and urges that “it is time to bring falling apart into fashion.” It is through being able to fall apart, such as manifested in crying and in deeply sharing with others, that we are allowing ourselves to further develop. In the movie, “Ordinary People,” it is through Conrad’s sobbing with his therapist regarding his pain and anguish about his brother’s death that leads to the start of a healthy grief process. His tears ameliorated his guilt and self-reproach and brought about an attitude of self-compassion and forgiveness. This attitude of forgiveness and self-compassion eventually allowed Conrad to “live again” being able to get involved in activities that brought him pleasure and satisfaction, a far cry from his past depression. Being a student of life means being vulnerable—open to life, to learning, to experiences, to yourself and to emotions. Most of all, it means being willing to accept things as they are, no matter how painful that might be. Change begins with the courage to be vulnerable, that is, in exploring and accepting one’s genuine feelings, which often can be viewed by our self and even by others as shameful weaknesses. 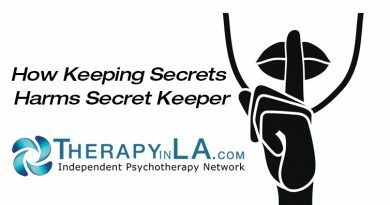 It is often helpful to work with a therapist to face what you could be defending yourself against. The therapist can work with you in helping you to understand where your weaknesses lie and in turn can help you in learning to accept them without guilt or shame. Guilt and shame only keep our vulnerabilities locked up inside and don’t allow them to be opened up and seen from a compassionate stance. In the perspective given to us by the movie, “Ordinary People,” we see how destructive that process of walling off emotions, walling off our so-called “vulnerabilities” can be. As can be clearly seen in Conrad’s mother, Beth, unable to open herself up to the grief process for the pain and loss of her older son, also walled herself off from giving love and receiving love and the support of others. This defense eventually led to the shattering of her nuclear family. A therapist can help us to develop self-acceptance and self-compassion that allows for further understanding and exploration of our emotional self, our more vulnerable self. Be honest with yourself; look for deeper reasons or motives for your own behavior. You can start by imagining the worst thing that can happen and start exploring and understanding your fears. Take a risk. Start by letting someone you trust know your weak places. Be willing to listen to honest feedback, even ask for honest feedback. Accept the fact that you have anger, and find constructive words to talk about it. Let go of guilt and resentment. The past is past. Make amends if needed. Accept that you make mistakes. That’s part of being human. Start the development of increased self-acceptance. It is a paradox, but change takes place through acceptance. Dr. Peters is a psychotherapist in practice in Encino and Glendale, and is a member of the Independent Psychotherapy Network. He can be reached at (818) 475-2666 or via email at Gappsyche@aol.com. Copyright 2017 by Glenn Peters, Ph.D.